The magician then feels the backs of the cards one at a time and is able to find the selected card by sensing which card is warmer from the spectators touch! 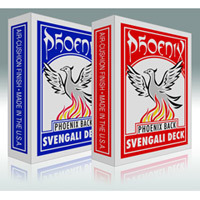 The famous trick deck that does all the work for you - now in Phoenix Deck quality. Handcut and corner rounded in best quality.